Many people decide to remodel their kitchens by doing things like replacing cabinets, adding new appliances, putting down new flooring, etc. In order to do that, you and the contractors need a precise plan of action. A kitchen remodel cost calculator template will assure that both you and your contractors have the information on the cost of the proposed remodeling instructions and materials. A template is the best way to get this vital information in writing so that you won’t go over budget when planning the remodeling of your new dream kitchen. An appropriate guide like the kitchen remodel calculator template provides a file that lets you fill in the blanks to put in all of the details about the appliances, cupboards, floors, plumbing and all that goes into building a new kitchen. This spells it out exactly so there can be no mistakes. 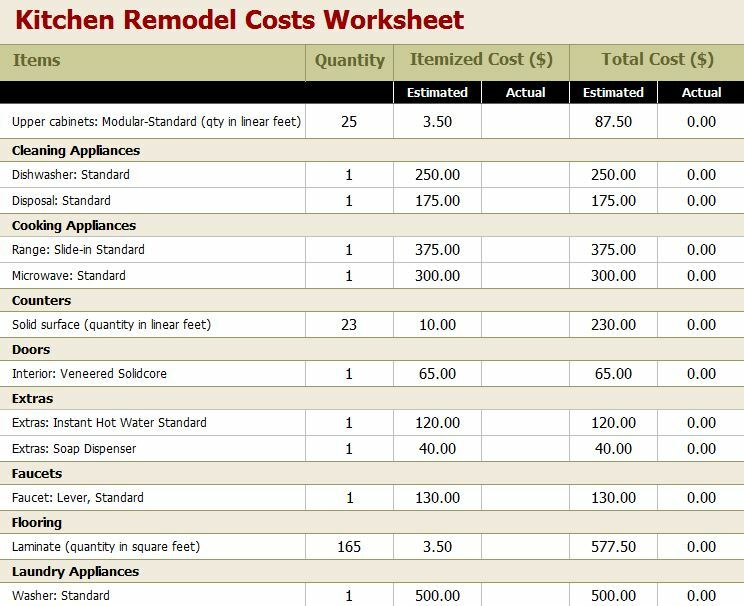 First, download the kitchen remodel cost calculator template and save it to your computer. The template is totally free from this page and is wholly customizable to your needs. Next, fill in the customizable data, including all of the kinds of things you want to buy for your new kitchen and each one’s costs. Third, after tallying up all of the categories, name your file a precise label so you can’t accidentally copy over the original kitchen remodel cost calculator template and then save it. First, be sure you know what you want to put into the essential fields. You should print it out and take it to the store where you will be buying your kitchen supplies and fill it in. This printed version is your rough draft and you will use it to fill in the permanent electronic version when you are done. Second, verify the facts and prices. Be positive you have put down all of the data and figures. Check the spelling and grammar as well and see if the items need product numbers or any special wordings. Third, it is a good idea to keep a back-up of your Kitchen Remodel Cost Calculator Template. After you copy all of the data from the rough draft, double check it to see if it matches your draft and then save it in a safe place like a hard drive, thumb drive or CD. This will ensure you always have a copy that can be printed off if you lose the first one. The main point is that it is good business to complete a Kitchen Remodel Cost Calculator Template if you are planning to remodel your kitchen. By employing this downloadable and free Kitchen Remodel Cost Calculator Template you and your contractor will be able to complete the job swiftly, simply and skillfully every time.